Bridges is the name given to another popular puzzle from Japan. The aim of bridges for those not familiar with this puzzle is to connect together a set of islands according to simple rules. Each island says how many bridges are connected to it, and they run horizontally and vertically. There can be no more than two bridges between two individual islands, and bridges cannot cross, and all islands are connected together through the bridges. This means that there is no isolation at all, and in a valid bridges puzzle you can 'island hop' from any island to any other island. Bridges is also known as hashi or its full name hashiwokakero which is the original Japanese name for this puzzle. As such, bridges puzzles are a good test of logical thinking and a fun problem to solve. 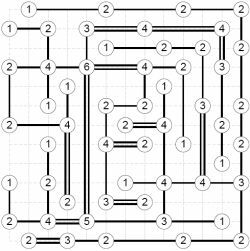 Smaller puzzles in particular are quite quick to solve whilst presenting a nice challenge. As a more visual puzzle they represent a nice alternative to puzzles such as sudoku. Compared to many Japanese puzzles they are a little easier. A sample of a solution is shown on the right. Clarity Media can provide bridges puzzles in a selection of sizes and difficulties; all puzzles supplied in PDF or EPS format for easy print publication. If you are interested in buying hashi / bridges puzzles for print publication then please contact us via the link below and we would be pleased to send sample hashi puzzles and discuss your requirements in more detail. Publishers - Please contact us to buy Bridges puzzles for publication in your book, magazine, newspaper, any other printed media or online.